Everybody has their favorite Chocolate Chip Cookie recipe. Goodness, there are sure plenty of recipes to try til you find what is your personal favorite. These happen to be mine. They have a package of pudding added to the dough. What I like even better is the chocolate pudding added to make them double chocolate chip. Mmmm. 1- 4 serving pkg of instant vanilla pudding (or chocolate...;-)!! Combine the ingredients, stir in about 1 c. chocolate chips. Bake at 350 for about 8 minutes. They must just be turning a slight color and look slightly under baked if you like them to be soft and chewy. They girls whipped up two batches, one vanilla and one chocolate, and they turned the chocolate into a cookie cake and decorated it into a volley ball.....clever girls, and it looks great! In order to make it into a cookie cake, just put the dough into a greased pizza pan and bake it for about 20 minutes. Let it cool completely and decorate it according to the occasion. It makes a good alternative to a birthday cake for a kids party. These cookies do look soft and chewy..yummy! Cookie pizzas..what's not to like?? Yea Amy! I love that volleyball. It's inspirational and speaks volumes. Love the volleyball cookie! what a great idea! 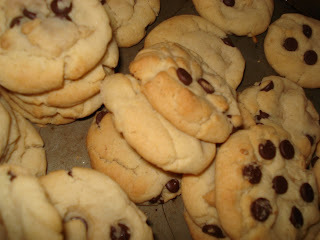 Oh my...Vanilla chocolate chip...now I have a craving to try these...right now...! I scrolled back to a few of you other posts and I'm going to have to make the apple dip....perhaps just for a bagel in the morning...Your Blog is the YUMMIEST! And teol the girls the Volleyball is ADORABLE! 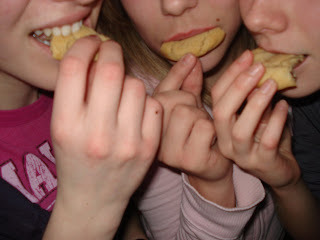 So fun, Char, it looks like the girls had a great time making some very yummy cookies. I will have to try these. These sound delicious! Pudding...never would have thought to add it to a cookie recipe. Can't wait to try these out after Lent! Yummy!!! These cookies would be the perfect treat right this minute!!! I am definetly trying this recipe!!! You might be able to substitute custard powder for the package of pudding. If it comes in a canister, use the amount that will make 2 cups of custard; that is how much a 4 serving box of pudding makes. Of course, you add the powder dry, do not make custard first. Many thanks Jenny..Cant wait to try these..Christine from Doha. I baked both varieties with my daughter yesterday. They are so wonderfully soft and melt in your mouth yummy. Thanks for sharing this recipe. The will become a family favorite now. 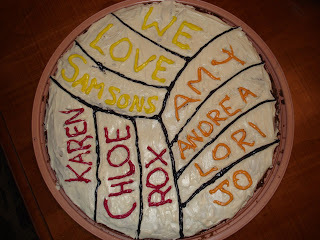 great job of the cookie cake!!!! Clever girls indeed - the cookie cake is fantastic!